Conant was educated at the University of Wisconsin, the State University of New York at Buffalo, and the Art Students League in Manhattan. 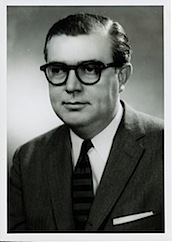 He served as chair at NYU from 1955–1977, and was head of the Department of Art at the University of Arizona until his retirement in 1987. Conant is the author of many books on art education including a series of art discovery books by McGraw-Hill. In 1953, he hosted “Fun to Learn about Art.” a children’s television programs on art education on WBEN-TV in Buffalo, New York. Conants paintings have been exhibited in one-man shows in the United States and abroad and are housed many public and private collections. His earliest works depicted Wisconsin landscapes, his New York works focused on geometric abstractions, and his Arizona works incorporated the textures, colors, and motifs of the desert, his wife said. “Howard Somers Conant,” Westport Public Schools Digital Collections, accessed April 23, 2019, https://collections.westportps.org/items/show/2043.